The madrigals of Carlo Gesualdo da Venosa belong among the most fascinating works in music history. They are often performed and are available in various recordings but it is difficult to get a grip on them and the personality of Gesualdo remains somewhat enigmatic. In many ways he was a loner, whose style cannot be compared with that of his contemporaries. He also composed sacred music but that part of his oeuvre has been more or less overshadowed by his madrigals. However, his Responsoria for Holy Week have found considerable interest among performers, and in recent years several recordings of these works - complete or parts of them - have been released. Last year Mark Sealey reviewed the interpretation of Philippe Herreweghe with his Collegium Vocale Gent (review). Not long after the review was published the present interpretation was released. The main difference between these two recordings is the size of the ensemble. Herreweghe used 15 singers, whereas the Compagnia del Madrigale comprises just six. It is not known for sure if these works were ever performed in Gesualdo's time and if so, where and under what circumstances. Were the Responsoria written with a liturgical purpose in mind? Marco Bizzarini, in his liner-notes, thinks so. He points out that in these works Gesualdo "abides by the rules of the genre of sacred music by the constant use of the time indication (tempus imperfectum diminutum), always accompanied in this edition by the chiavi naturali (...)." He also points to the inclusion of other pieces which are part of Holy Week liturgy: the Benedictus (the Canticle of Zachariah) and the Miserere, one of the penitential psalms. That in itself gives no clue as to how these pieces have to be performed. As long as we know so little about the circumstances and the number and identity of the singers of a likely performance in Gesualdo's own lifetime it is impossible to say which approach is right. Having heard each of these performances I am impressed by and happy with both of them. 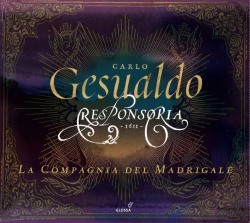 In the present recording the Responsoria are very close to the madrigals. That is partly due to the stylistic similarities. Gesualdo does not go quite as far in his individualistic approach to the text as he does in his madrigals but his idiom is not fundamentally different. That is impressively emphasized by La Compagnia del Madrigale. The adopting of one voice per part allows for a personal colouring of the individual parts, a maximum transparency and as a result optimum clarity of the text. There is also more room for a certain amount of freedom in the shaping of the lines and stronger dynamic accents. There are some striking fortissimo passages which would probably sound exaggerated and would even be counter-productive in a performance by a larger ensemble. Herreweghe wisely shows some restraint in this department. Apart from a different approach to the Responsoria this recording has some nice extras to offer. Every Nocturn is followed by a piece which doesn't belong to the collection and sometimes these are by other composers, as indicated in the track-list. Most of these pieces are spiritual madrigals, an important genre at the time which today is not often performed. The composers belong among those who Gesualdo specifically admired. De Macque, of Flemish origin, was a highly skilled keyboard player who for some time was in the service of the Gesualdo family and was one of those musicians who influenced Gesualdo's development as a composer. Luzzasco Luzzaschi was the composer he admired most of all. In many ways he saw him as a model for his own madrigals as Luzzaschi was very interested in a close connection between text and music but did not fully embrace the stile nuovo which emerged towards the end of his life. Another representative of the stile antico but also an advocate of expression was Luca Marenzio. One of the spiritual madrigals is from Gesualdo's own pen, and included in his fourth book of madrigals. Also included are some pieces which were neither part of the Responsoria nor of one of the two collections of Cantiones Sacrae (both from 1603). Ne reminiscaris, Domine is taken from a collection published in 1585 whereas In te Domine speravi is from an edition which appeared in Naples in 1620. These are hardly ever performed and that makes their inclusion in this album of major importance. As I have indicated I am very happy with the recordings by Herreweghe and La Compagnia del Madrigale. Fortunately I don't have to choose, and if you can afford to purchase both recordings, don't hesitate. If not, it is probably a matter of taste. This review and Mark Sealey's assessment of Herreweghe's recording will probably help you to get a good impression of what to expect. The additional music in this production could be a factor in its favour, but in regard to interpretation you can't go wrong with either of them.